Home Blog It’s NEW TAX PACKS time! It’s NEW TAX PACKS time! April 6th 2016. The most exciting day of the year for us, barring birthdays, anniversaries and special occasions. “Why”, you may well ask? 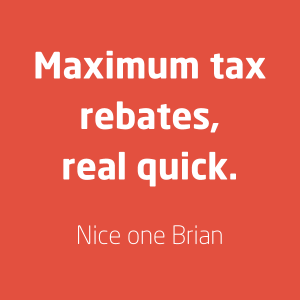 Well, it’s the day that you can claim your 24 hour tax rebate for 2015/16… hurray! And this year we’ve made it even easier! Our new tax packs have been given a bit of TLC. We’ve made them a little easier to navigate through and taken some of the bulk out of them. From the first page right through to the end, we’ll take you through the process step by step. All you need to do is send it back to us completed and we’ll calculate your rebate. Why not look for yourself? You can download our brand new tax pack here. AND REMEMBER… if you provide us with a fully complete tax pack by 5th April 2016, we could have your rebate to you the very next day! New tax packs. Nice one Brian!